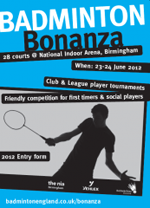 The smash hit Birmingham Badminton Bonanza makes a welcome return to the National Indoor Arena in Birmingham this June offering a big weekend of friendly competition and family fun. The world class arena, which plays host to the All England Open each year, opens its doors to badminton players of all ages, sporting ability and ethnicity on 23rd & 24th June as action over 28 courts takes centre stage. This year there are 4 standards of game play to choose from with social, local club, local league and junior age group categories to play in. So, if you are new to the world's fastest racket sport, learning the craft on court, a seasoned pro on the club circuit or a regular league player there is something to suit your wishes! To download the information booklet and entry form click here. Alternatively, enter online by clicking here. The deadline for entries is Friday 25th May 2012.